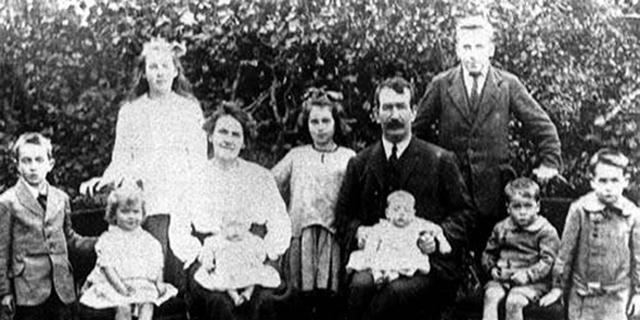 First photo: Left to right: Jerry, Una (sitting), May, Mother with Peader or Paul, Peggy, Father with Peader or Paul, Jimmy, Dan and Billy. Shortly after this photo was taken, one of the twins Paul passed away. Kevin and Eileen were not yet born when this photo was taken. See also later photo and family tree. Second photo: This photo was taken on May 5th, 1955. 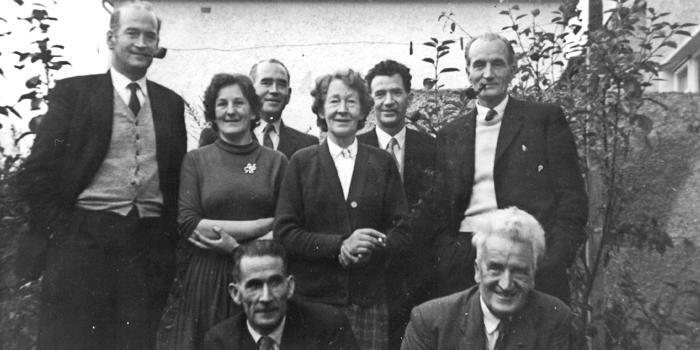 Standing: Peadar, Eileen, Billy, May, Kevin and Jerry. Kneeling: Dan and Jimmy.These people were eight of Donal and Mary Crowleys’ fourteen children. In 1998 the last two surviving members of this generation (Peader and Una) passed away. This photo was taken on the last day that the Crowleys lived here at Friars Walk. After this photo was taken the house was knocked down to make way for a social housing development.